Soft and stylish, these baby booties are made from colorfully woven Pendleton® wool. You're never too young to cultivate a bohemian look. 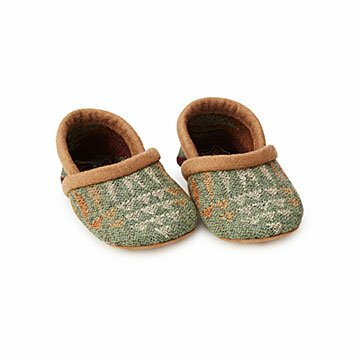 As soft as they are stylish, these baby booties are made from colorfully woven Pendleton® wool in Pacific Northwest-inspired patterns. Trimmed with ultrasuede accents, they're easy to slip on and off little feet. Choose from two unisex patterns for babies up to a year old. They make a sweet gift for baby showers and newborn welcomes. Handmade by Della Slowik in Oregon City, Oregon. Designer Della Slowik returned to the U.S. enraptured with Japanese culture after a 2002 trip to the island. Motivated to translate her newfound inspiration into gifts, Slowik began crafting ornaments shaped like fresh sushi rolls. Della soon expanded her line into everyday objects with a sense of humor, like plush slippers shaped like vibrant sushi rolls and oversized fortune-cookies. "I haven't stopped making Japanese items since!" Perfect gift for expecting mother! Very well made and cute packaging. So Adorable! Used in our Pregnancy Announcement Photo! They are a bit large, but once baby can fit into them, you better believe the little one will sport these all the time! No boring gift registry for me! These were for a baby shower! Everyone loved them! Of course these baby booties were a gift to a family member. If I hear anything but good reports, will let you know. But I saw them (got the blue teal) and they looked well made and comfortable. I purchased a pair of these for my newborn great nephew. His parents were impressed with the craftsmanship as well as the look. I bought the teal because it is my niece's favorite color and she was not disappointed.